Skye Gould/Tech InsiderTechnivorm’s 10-cup KBT Moccamaster. Homemade cups of coffee often don’t taste as good as the ones you buy in a coffee shop. But with the right coffee maker, you can get closer to the perfect brew. To find the best machine, Tech Insider consulted FIKA’s CEO, Lars Akerlund. With 17 locations around Manhattan, FIKA is one of the city’s fastest growing coffee chains. Akerlund says he uses a Technivorm Moccamaster in his own home. In his opinion, it’s the best coffee maker on the market. The Moccamaster has mastered the brew cycle, Akerlund says, because the machine keeps the water temperature and brewing time incredibly consistent. Most machines make a mediocre brew for two reasons: They can’t keep the water at a uniform temperature and the brew cycle is either too short or too long. This means that, even with the most expensive coffee grounds, the average machine can’t extract the full flavour from the beans. The Moccamaster, on the other hand, uses a highly-conducive copper lining to boil the water in seconds. Before the machine drips the coffee into the pot, it keeps the liquid in the basket for 30 seconds, which immediately and uniformly extracts the beans’ flavour. The water (which stays at 200 degrees) comes out of a shower head-like device that sprinkles it over the whole basket. This way, the machine maximizes the flavour from all of the grounds so you get the most value out of the beans. Other coffee drinkers seem to agree with Akerlund. 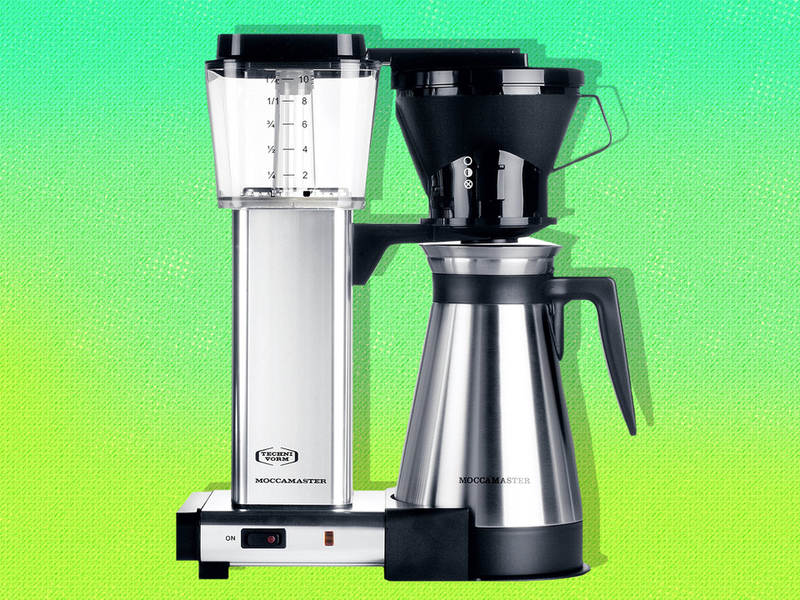 America’s Test Kitchen, an organisation that rates recipes and appliances, dubbed the Moccamaster “the best automatic drip coffee maker.” On Amazon, over 420 users have given it an average of 4.4 out of 5 stars. The 10-cup machine is handmade in the Netherlands and comes in a variety of models. The higher-priced ones feature thermal carafes, which keep your coffee hotter than glass pots (without burning it). You can buy them in silver or black from Amazon or Technivorm’s site. Ranging from $269 to $319 depending on the model, the Moccamaster isn’t for the casual coffee drinker. But Akerlund swears it’s worth it.